The Grand Forks Dog Training Club strives to promote responsible dog ownership in the communities we serve, through seminars, workshops, and classes. We are proud to have multiple instructors in our puppy & early obedience classes to offer the individual instruction our students need in order to raise a happy, healthy, and well-behaved dog. 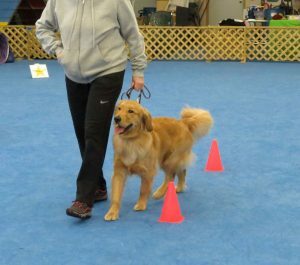 Many take classes for a variety of reasons — some to have fun bonding with their dog and some to prepare for competition. Whatever your training goals are we invite you to sign up for a class! All instructors of the GFDTC are volunteers. We are people who enjoy not only training our dogs but also educating the people in our communities about effectively communicating with their dogs. Class fees help cover the cost associated with our building and training materials. Not all classes are offered every session. Please fill out a CLASS INTEREST FORM online HERE to start the class sign-up process. Some classes can fill up fast or have waitlists. The best thing to do if you are interested is fill out a CLASS INTEREST FORM online HERE. The form is not obligationary and you will receive a follow up email with information on the requested class and how to secure your spot in a class with payment. Check upcoming class schedules on our calendar. Mail: (this is not the class location!) GFDTC, 1905 So Wash St, Grand Forks, ND 58201.